Discussion in 'Guitars in General' started by g335, May 7, 2008. Birthday is coming and I want to buy something. I have been saving money and want to spend!!!!!!! I want a guitar. I play all kinds of music, I like all kinds of music, stuff like the Cure, New Order, Lush, Soundgarden, AC/DC, Police, etc. I have a Gibson 335 and a MIJ Jazzmaster. But dont play them so much now. I want something fun to play. Something that will keep me running home to play everyday. I have about 1000 dollars to spend give or take $100. Used or new is fine as long as fun. I don't know if I want a Les paul, Strat, Tele, a emg pickup guitar for metal, another semi hollow, . Epiphone and maybe MIJ Fender or MIM Fender and two for the money. Schecter Tempest Black Jack, or Ultra 3. I live in Japan and where I live I can't play all of the guitars I have seen on Musicians friends and other places. Please give me thoughts and suggestions. In your price range I'd probably recommend a Strat. Whammy bars are fun! we have had good luck with the 50's and 60's made in mexico teles here, just swap pups and they KiCk!!! Oh I can buy from the states, it just I don't go home often so hard to try guitars here if they don't have them. I can get anything from the states mailed here. OK ... so you have a nice amp ... was just checking as I think a great amp + average guitar keeps you playing longer than an average amp and a great guitar. My vote would go to an American Deluxe strat and a Hughes & Kettner Statesman Quad or Dual EL84 ... but I don't know what your amp budget is. They'd make a fine pair! How about a Epiphone Les Paul and a CIJ Strat. Or CIJ Strat and a CIJ Tele? Check out the G&L guitars with the z-coil pickups, particularly the comanche (as it has the PTB system, which is a bass and treble control instead of tone, incredibly versatile, and a mini switch for more pickup combinations). My birthday is May 21st and I've already purchase a Korg Pitchblack for myself. I keep trying to talk the wife into an ES 339 but that would be out of your budget. May I suggest an American Standard Tele in ash with a maple neck. It's the best possible combination for a guitar. Trust me, and it can be had for around $1000. I have been thinking about a tele. I was thinking maybe split the money in half and buy a tele and a strat(CIJ or MIM) Good idea? Wish I could play the Schecter Ultra 3, looks nice. They have some of the Gretsch Eletromatic Projets for only about 600 dollars at this store here. What about the Electromatic new G5122 Double cut away guitar? 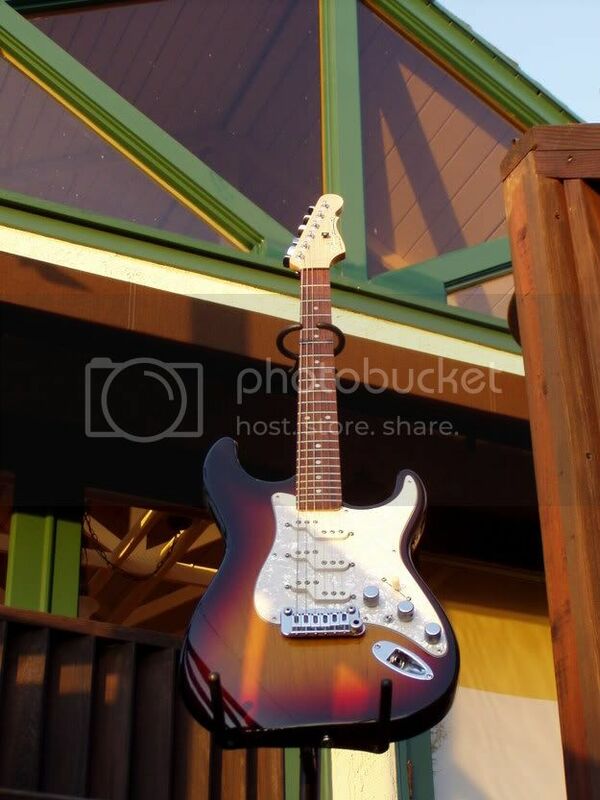 Try a 2008 Fender American Standard Stratocaster...redesigned...unbelieveably amazing guitars for right around $1000.00. I just bought one...under 8 lbs and tone, tone, tone! A lot of people that live here in the USA are unhappy that they can't get CIJ Fenders here, I certainly wouldn't overlook those if I lived in Japan. They are good, really good. They have vintage necks compared to the MIM. When I last played a MIM a few years ago back home, they were good but not as good as the CIJ. I am surprised that they put real USA pick ups in their 500-700 range of CIJ's. I guess from what I have read, the electronics are the only thing needing to be upgraded. I am looking at a CIJ 62 tele deluxe for about 650 dollars and there is a 62 strat with "American Vintage pick ups in them for around the same price. Hmmm But getting a MIA Tele or Strat may be good. I tried the Highway One tele and did not like it at all, the CIJ tele was better. Les Paul Studio be better. I really want to get a good guitar and fun next week. Strats, ahh don't know if I can buy one, still don't like them so much except after seeing The Police live, I keep thinking about the great tone Summers had. Everyone's posts are helping and I am going to try out as many as the guitars that were suggested if they have them in the stores here. Oh please remember I am using a Vox Ac15cc right now.